A Zebra Cab in GTA Vice City. The Zebra Cab is a special taxi featured in Grand Theft Auto: Vice City. 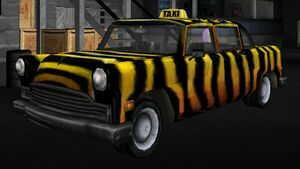 The Zebra Cab is a modified Cabbie, painted in a yellow-and-black zebra pattern, with darker metal trims and bumpers. The Zebra Cab first appears in the final Kaufman Cabs mission, "Cabmaggedon", where it is driven by the owner of Vice City Cabs as he attempts to run down the player. After that final Kaufman Cabs mission, the Zebra Cab spawns inside the cab depot, replacing the Kaufman Cab that had spawned there. It emits the sound of a high-performance engine, same as that of a Sentinel XS or a Sabre. It has superior performance to both the standard Cabbie and Kaufman Cab, with slightly improved top speed, acceleration and handling. As implied before, it spawns inside the Kaufman Cabs depot after Cabmaggedon. Despite being painted yellow-and-black, the game data files contain code for a red paint job. Furthermore, when the player bumps the Zebra Cab, red paint chips will spawn from it. Also, if the player is wanted by the police, they will be described as driving a "red taxi". Borgnine, a similar bonus taxi in GTA III. Bickle '76, a similar bonus taxi in GTA Liberty City Stories. This page was last modified on 19 April 2015, at 19:36.